This is the first time I have ever been to Giggling Squid*. 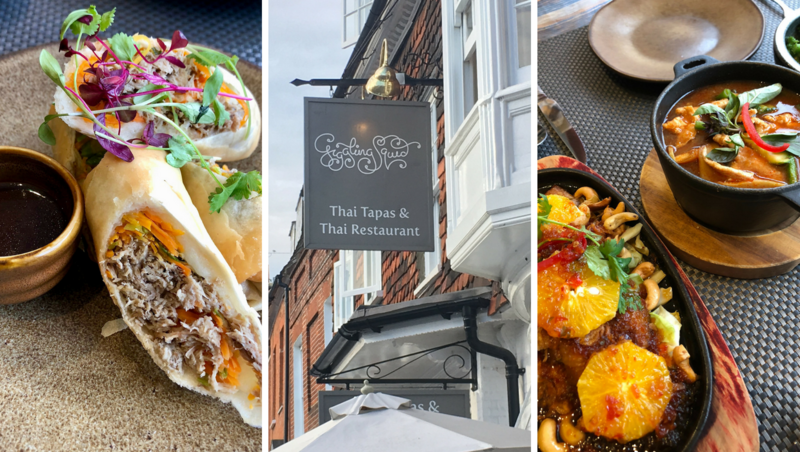 I haven’t heard too much from others about this Thai Restaurant and Tapas but it must be popular as there are 25+ restaurants and there wasn’t any let up on the number of people coming through the doors. Nestled in Castle Street, walking into the Giggling Squid Farnham was like being welcomed with open arms. Spacious and architecturally beautiful, this building has character. Anyone who knows Farnham knows the buildings have history behind them. 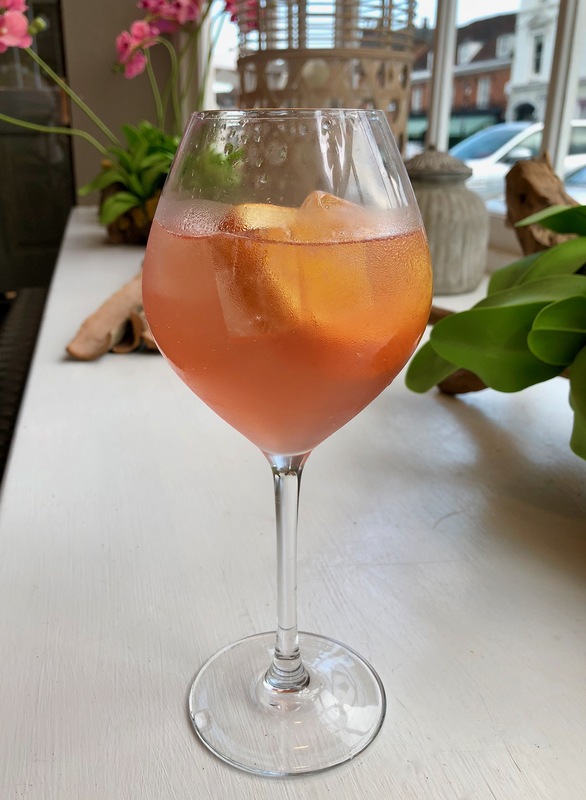 Eating out is one of my favourite things to do and what better way to kick start the weekend than sitting down in beautiful grade II surroundings and sipping on a Giggling Squid Cosmo. The menu is varied covering your general meat choices, fish, veggie and even catering for those who are gluten free. There is a real personal touch to the menu where dishes are described which was heart warming and made the experience more personable. Nailing exactly what to have took some time, not because there wasn’t much I would eat, quite the opposite, I fancied pretty much everything. First up were the Starters. 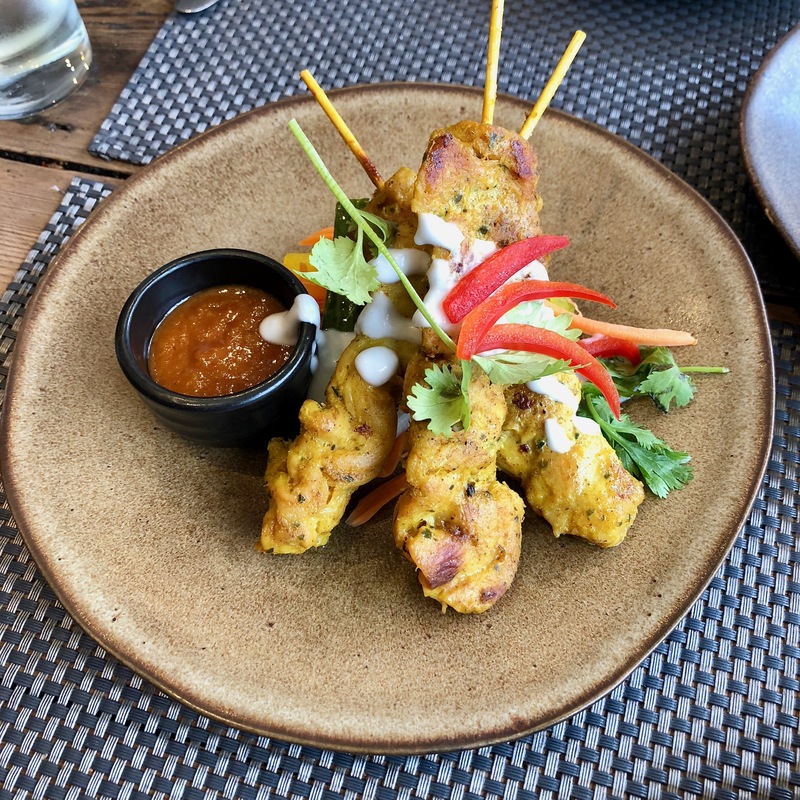 Chicken satay is one of my favourite dishes, mostly because of that delicious peanut sauce. Perfectly cooked the chicken was fragrant and slightly charred from the grill making it gnarly and delicious. The peanut satay sauce was of course the perfect accompaniment and the A-jard pickled vegetables were a little topper creating a slight sweetness to the dish, and brought everything together. Spring rolls with a twist. 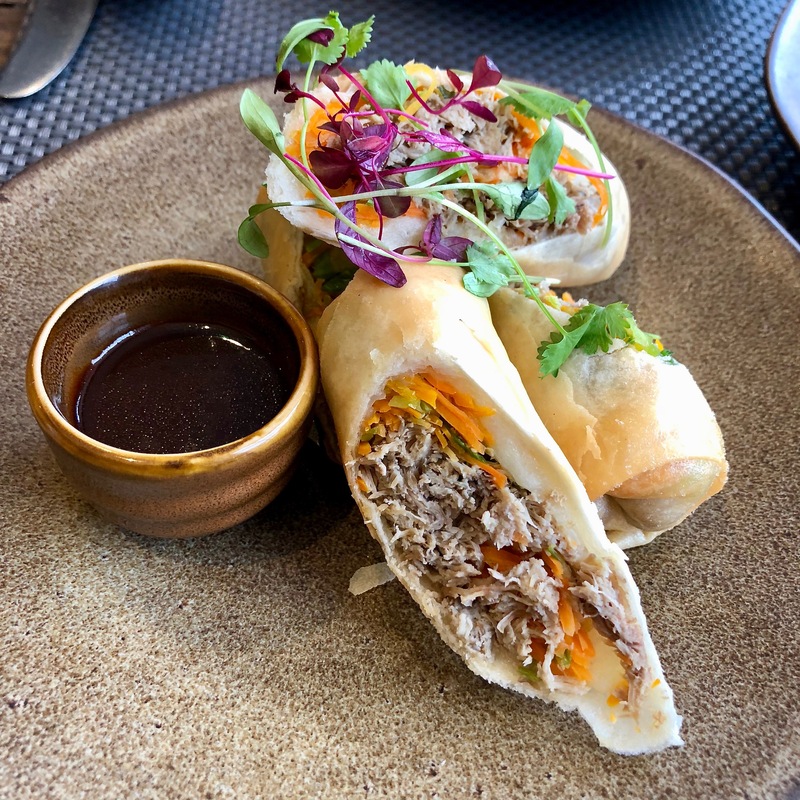 Move over veggies and chicken because shredded duck spring rolls are here and they are de-lic-ious! Super crunchy pastry encased an abundance of duck, carrot and spring onion, and with a side of the most delicious sauce made this a highlight of the evening. The sauce I think was a tamarind sauce and was just beautiful, next time I would ask for a second pot because there just wasn’t enough to go around. As soon as I saw the menu I instantly knew I would order the Sleeping Honey Duck, and it did not disappoint. With the sizzle of the special honey glaze sauce hitting the hot plate the smell alone had me wanting in. Sticky and sweet the combination is a proven winner and here was no exception. 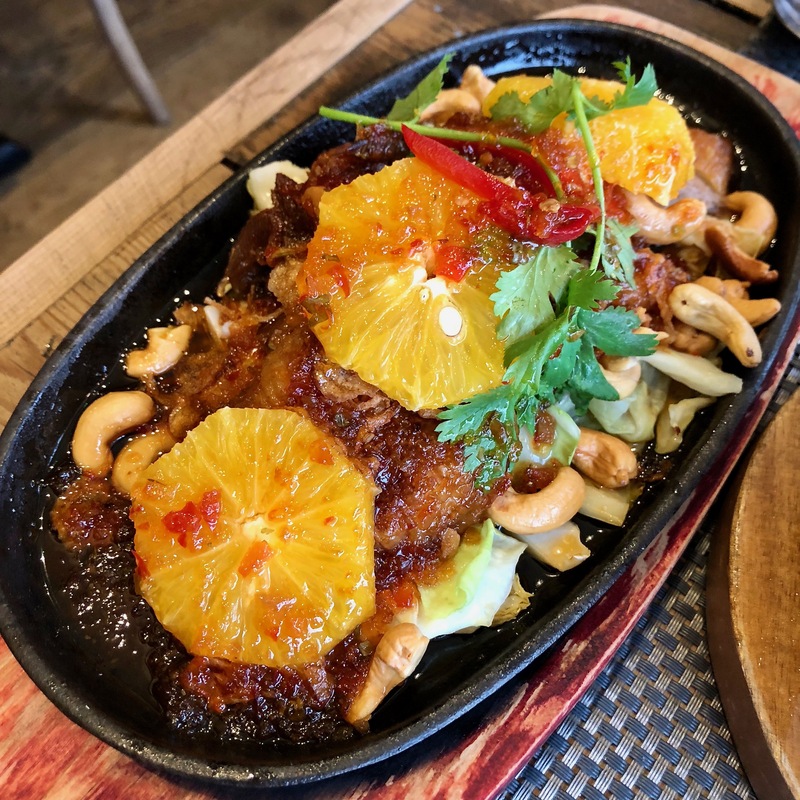 There was a freshness from the orange, sweetness from the glaze and crunch from the cashews and cabbage. The duck was cooked well, however the real drawback here was there just wasn’t much duck and for the price I would expect there to be much more. A curry like no other this Thai curry does not use coconut milk, what is this madness I hear you cry? Instead this incredibly fragrant curry is jam-packed with Thai herbs. 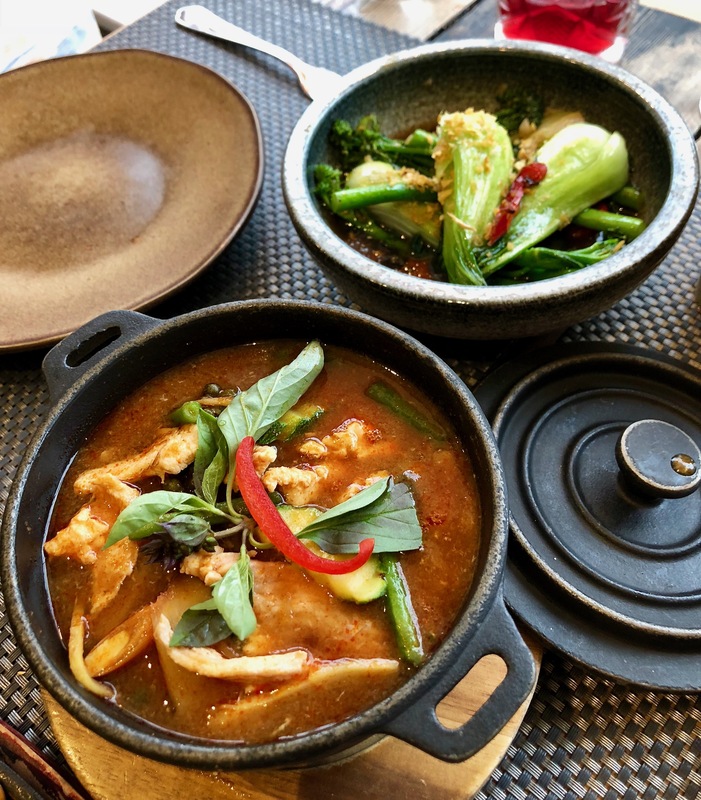 I am not sure what I think a jungle would taste like so cannot determine if this meets the title but it is the tastiest Thai curry I have ever had. A lot lighter than other curries it had intense balanced flavour, and a real fiery kick to it. The addition of veg was a plus point and helped bulk up the dish along with the sticky rice. Going all out, you just can’t say no to dessert. Back by popular demand this cake was buttery and light as a feather. Sadly detecting any mango flavour was hard which was a shame. 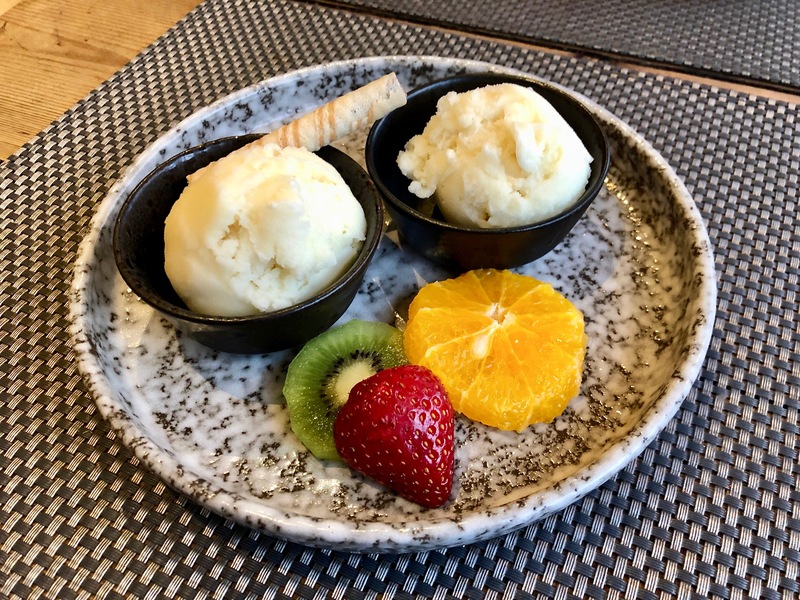 Our second choice, the Pineapple, Coconut and Mekhong Sorbet was exactly what was needed after this meal. Perfect cleanser, this was like summer in a bowl. 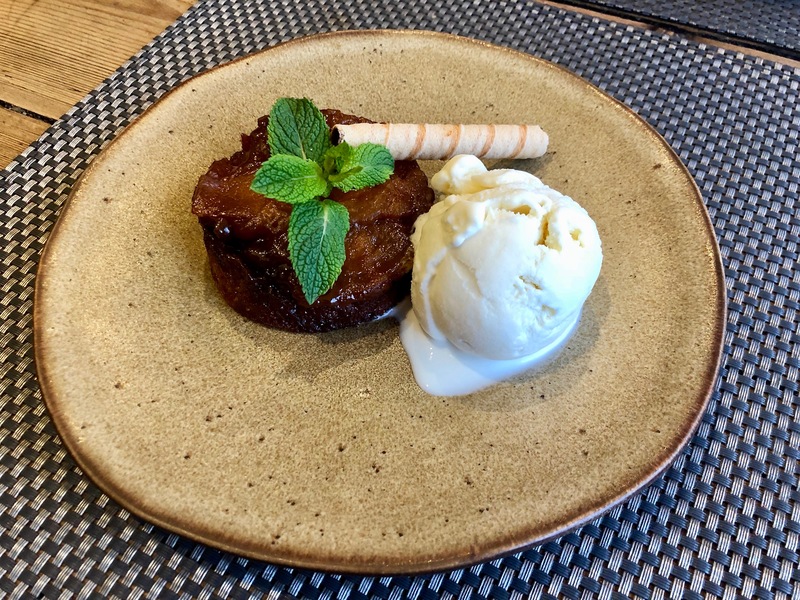 It had all the flavours of a Pina Colada and the boozy element from Mekhong a Thai spirit – bit like a whisky and rum combined, certainly smashed its way through. If I were basing this on flavour alone then the Giggling Squid Farnham far exceeded my expectations and absolutely knocked it out the park. Everything was fresh, fragrant, delicious and left us wanting more. The only drawback for me was the quantity of the meat particularly for the Sleeping Honey Duck. Whilst I would go back in a heartbeat, I would be more inclined to want to eat an array of starters or go for the Tapas at Lunchtime. When it comes to Thai food I much prefer pick and mix sharing with my friend’s and family, and this seems like a winning option both for quantity, variety and value when it comes to the Giggling Squid. *This was a complimentary meal from Giggling Squid Farnham and I was invited by Samphire Communications. All opinions are my own.